It’s been a beautiful warm sunny day here, and I drove down to Wivenhoe this morning to do – not artist visiting – but artist work collecting. Yes, the Lexden Arts Festival is really that close! First I met up with Annie Bielecka and we loaded my car up with twelve of her beautiful textile pieces. She had packed them so well that I couldn’t actually see the work, but they have wonderfully evocative titles such as ‘Harlech Castle Arrowslot’, ‘Oban from Iona’, and more locally, ‘Sunrise at Fingringhoe’, and ‘Colne Morning’. I am really looking forward to unpacking them all to see what Annie has given us, but that won’t be until I start to hang the work next Wednesday. Annie has had a very varied and interesting life, starting in a London Fashion house, and including making costumes for pop musicians, being secretary to a senior British woman politician and minister, and designing and making theatre costumes. After a serious illness over 20 years ago, design and art became her therapy and passion. She had always loved fabrics, and in her work she tries to combine silks and natural materials with artificial man-made materials and sometimes uses hand-made felt or wool she has spun and dyed on a traditional spinning wheel using fleece from her cousin’s sheep farm in Snowdonia. 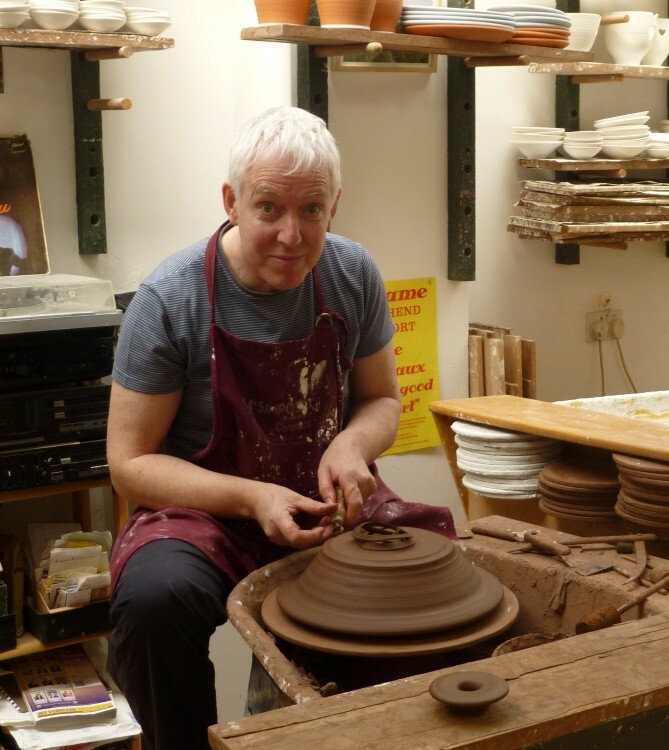 Pru’s ceramics need no introduction to Lexden Festival go-ers, as they have proved extremely popular in the past. Last year I had to ring her up half way through the week and ask her to bring more work, as we had almost sold out. This year, Pru is showing a striking new design, called Angela, and an unusual mug shape, which she told me she didn’t often make, as well as a whole range of variants on some of her popular patterns and shapes. When I got to the Sentinel gallery Pru and Rosie were busy tying up the loose ends after the first big Opening Exhibition which finished last Saturday, and getting ready for the next show, which is called Dodds & Co., featuring paintings, prints, film, pottery, poetry, photographs and sculpture by the very talented extended Dodds family – James Dodds, his wife Catherine, their children Dougie and Mary, and also Wendy and Bryan Thomas – I’m not quite sure where the latter two fit into the family tree! For more details check out the Sentinel’s website, www.thesentinelgallery.co.uk where images of Pru’s work can also be seen. 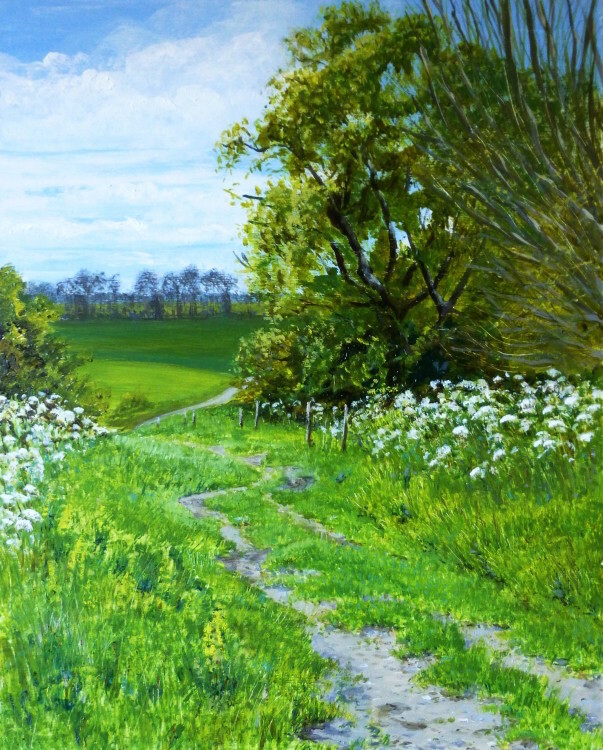 A new painting on the website this afternoon – Essex Field Path is from a drawing I did in May last year, near Maldon. I liked the contrast between the new lush grass and cow parsley, and the trees which were not all yet in leaf. This painting is my usual acrylic but has a lot of oil pastel, too, so I have labelled it mixed media. I must get on with ‘From my April Garden’ next, as April is flying past! I know exactly what I’m going to do for this one, and it features my Magnolia Stellata ‘Leonard Messell’. It is in spectacular full bloom at present right outside my studio window, but it has been so warm today that it will soon start dropping it’s petals if I don’t get it done very soon. 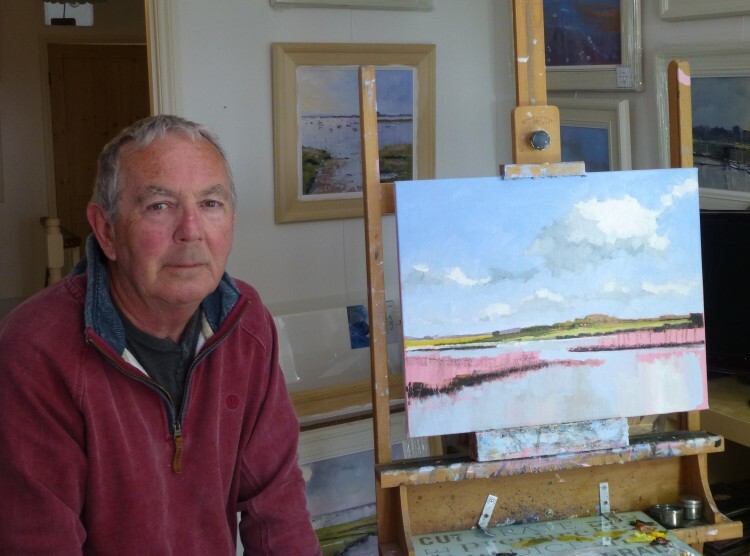 Nat Young’s paintings will be familiar to many from previous Lexden Arts Festivals, where his mixed media paintings have had some keen collectors. 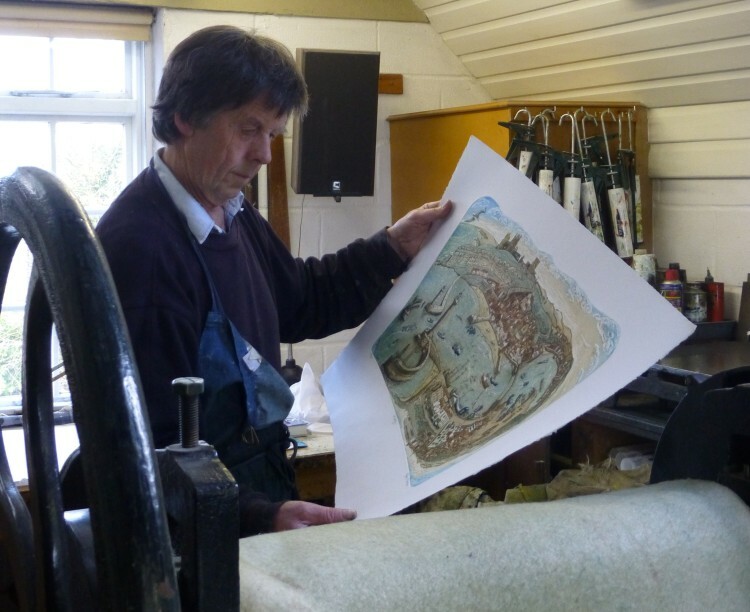 We are delighted that he’s showing with us again this year. He came over to my house this afternoon with a pile of paintings and we went through them one by one to choose the selection. The paintings told a tale of Nat’s journeys to the North of England, Scotland and the Welsh coast, and I’m sure they are going to meet with more admirers at the beginning of May.